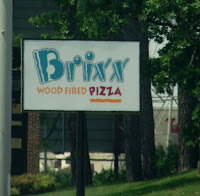 Would you like to know why I like Brixx Pizza in Knoxville, Tennessee? It's because the food is good and the atmosphere is upscale, peppy but relaxed. Options like carry out and catering help. So does the great outdoor patio and great service. I tend to shy away from the bar area in favor of more quiet conversations. The folks I've seen at the bar at Brixx Pizza always seem to be having a good time. Many thanks to my blog reader for a super recommendation! My first visit was about a year ago after driving a Dogwood Trail. Now, I'm hooked. There are two Brixx Pizza places in Knoxville. One is on Kingston Pike across from the former K-Mart. It's right next to the 3 Minute Car Wash. The other location is where the Atlanta Bread Company used to be on Parkside Drive. The Brixx Pizza on Kingston Pike is one of my favorite pizza places. It's a great place to meet with my daughter and her boyfriend. There is plenty of parking and the restaurant is easy to get in and out of. Pizzas are wood fired and cost between $8.95 to $10.95. My fave is the Bronx Bomber! I'm allergic to gorgonzola but the staff has always been nice to substitute mozzarella. The 10” crust is as tasty as the spicy Italian sausage and always crisp. Fresh oregano leaves are sprinkled over everything for just the right touch. If you're in an appetizer mood be sure to try the hummus. One mound each of black bean, traditional and roasted red pepper come are surrounded with 12 pita points on a single plate. Soups, salads and sandwiches complete the menu. You can see it all online before you go. In addition to Knoxville, the site can help you find other locations too. Brixx Pizza sometimes has 50% off certificates available through Half Off Depot. Click the link to the left to do a search. It's a simple process to search, buy and print. If you see the certificate buy it. They seem to go pretty quick. If you go to Brixx Pizza and see me there be sure to say hello. If its a warm day I'll probably be on the patio with Hubby or Daughter watching the traffic go by. Monday-Saturday: 11 a.m. – 1 a.m.